Sparkling Adventures -✯- It's show time! 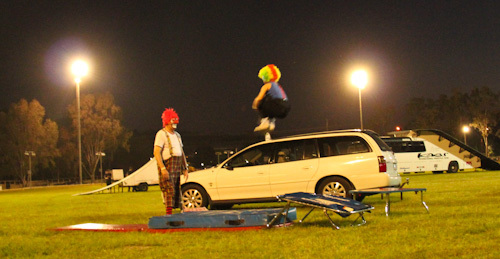 We were excited to discover that we were in town for the Beenleigh Show. We’re on the road again, heading out in our Freedom Truck rig, and so our first stop is only a couple kilometres from home. 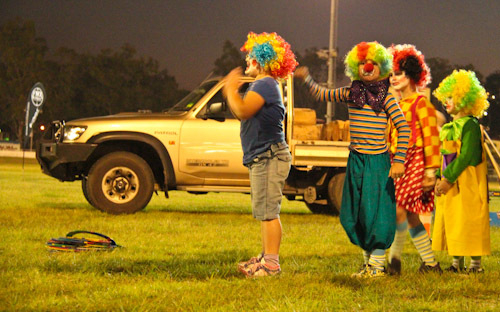 We last visited the Beenleigh Show three years ago. Back then, our girls were so much younger and we appreciated the animal exhibits more than the rides and show events. This year, our experience was reversed. We arrived in the afternoon, soon after the gates were opened. We walked around the showgrounds for a while first to look at what was on offer. 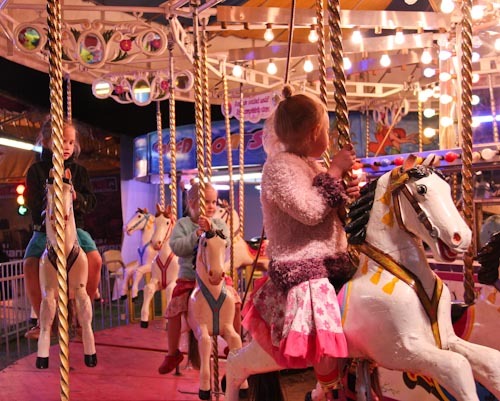 We wanted our girls to see all the the rides that are available and to let the seeds of desire grow within them so that they would choose to go on the rides where the desire had grown enough to make a request hours later. While walking around, we discovered two good vegetarian food options. The first that we tried was vegetarian Japanese yakisoba, and the second was a baked potato with a chickpea and coconut cream sauce. After filling our tummies, it was time to enjoy the show! 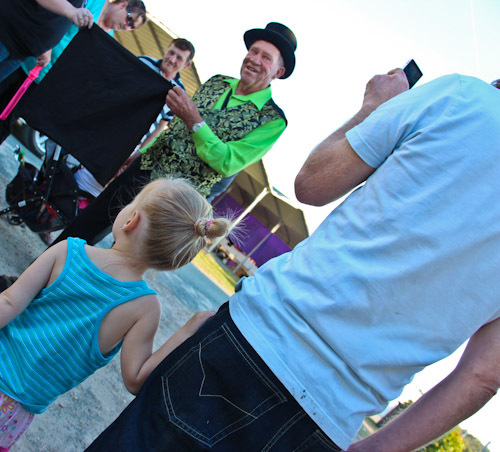 This friendly roving magician has a number of tricks that are both simple and baffling. David and I were watching very carefully but couldn't work them out! 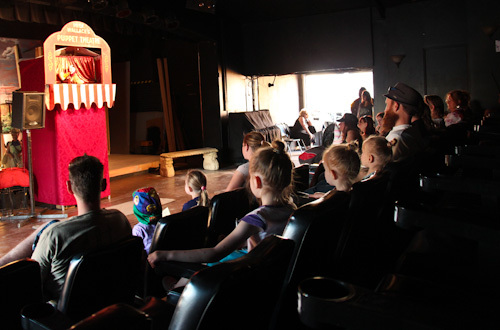 We entered a cool, darkened theatre room to watch the puppets on show. The puppets interacted with the audience, inviting comments and suggestions. 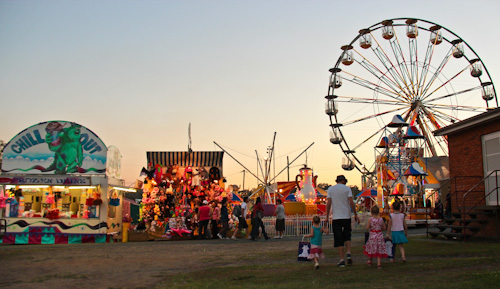 The Beenleigh Show has been going for 135 years now, and a main focus of this show are the agricultural and handicraft elements. Prize animals are shown, baked goods and flower arrangements are on display. Sugar cane is still grown in the local area, and each year a big prize is awarded for the best local sugar cane. 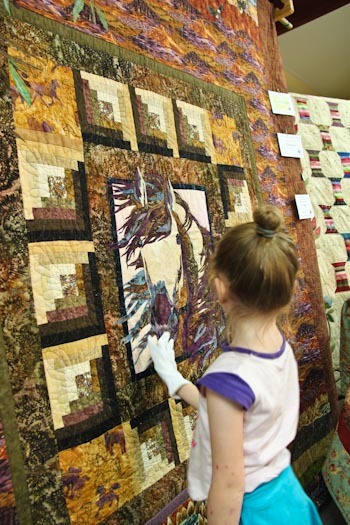 We liked browsing through the quilting displays. White gloves are made available to patrons so that they can touch the quilts freely without making them dirty. Our girls loved putting the gloves on and then took advantage of the invitation to touch! 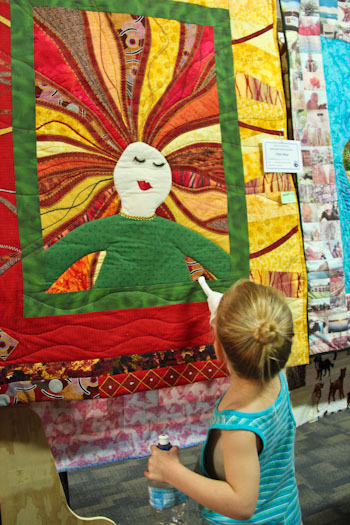 My favourite quilt on display is this beautiful, red-haired woman, created by Sheryl Hansen whose creation won first prize in the landscape or picture quilt division. This magnificent creation by Karen Green took the top prize at the Beenleigh Show. 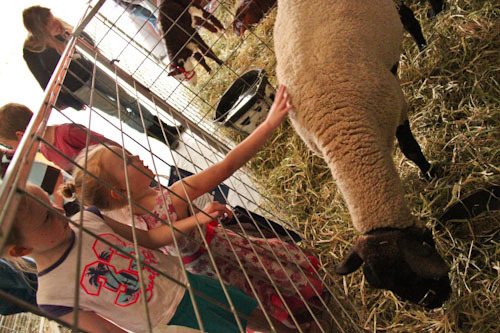 A local school offers a free animal nursery to give kids an opportunity to pet farm animals. 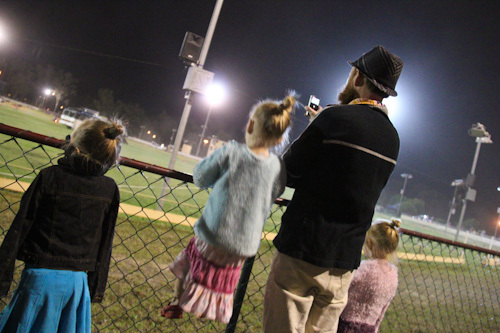 Once the sun goes down and the coloured lights come on, the showgrounds become much more exciting. 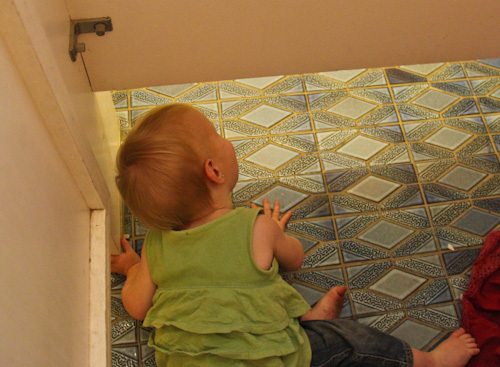 One of the highlights of the show for Delaney was the discovery that she could peer underneath the partitions in the toilets to see her sisters. Our first ride was on the classic ferris wheel. We wanted to get on the ride while it was still light so we could properly appreciate the views. 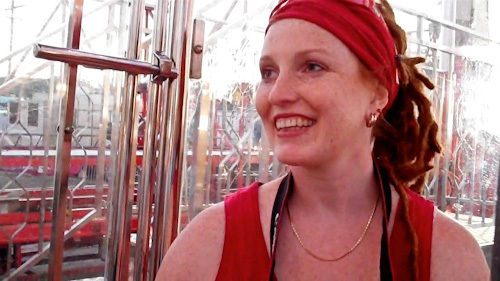 Riding the ferris wheel was the highlight of my experience at the Beenleigh Show. I felt giddy with excitement during the whole ride! Uninhibited by fear, our daughters fully embraced the experience. Brioni isn't afraid of heights and was happy to lean and point outside of our glass and metal carriage. 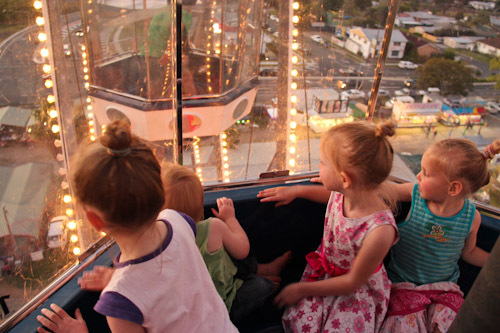 From the top of the ferris wheel, the girls could spy all the jumping castles and assess each one. 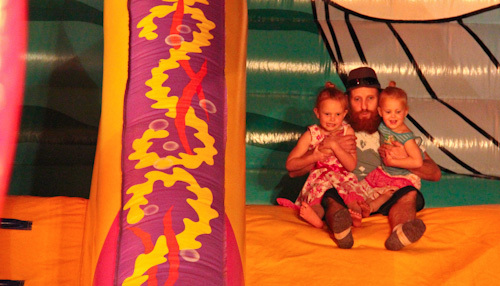 By the time we got off, they had agreed on the best jumping castle option — I’m thankful it was a unanimous decision! When Brioni and Calista stalled at the top of the jumping castle, David got to climb up to bring them down the (very steep) slide. During this time, many events were taking place in the main arena, and we returned to watch the action — just in time to meet Beppo the Clown. 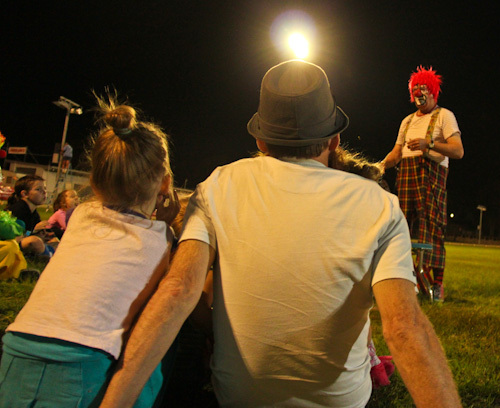 Beppo the Clown offers circus workshops and his young apprentices put on a display of their acrobatic skills in the main arena. Some of the young clowns are natural comics, playing up for the audience and taking advantage of every mishap to gain laughs. Beppo's comedic act followed his troupe's performance. One of the highlights of this year’s show has been the camel racing. 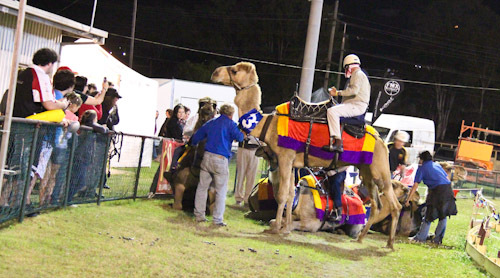 It wasn’t a serious race — local businesspeople were roped in to ride the camels halfway around the track. We were thrilled to realise that these were the same camels that we rode last year at a multicultural festival in Brisbane — albeit at a much slower pace! Mounting the camels took almost as long as the actual camel race. Another one of the main acts at this year’s show is the Crackup Sisters. They’re billed as an Aussie wisecracking, whip-cracking, slapstick comedy duo. Their caravan was very close to the arena, so we talked to them before their act. The Crackup Sisters sure know how to pose for a photograph! We enjoyed our chat with them. 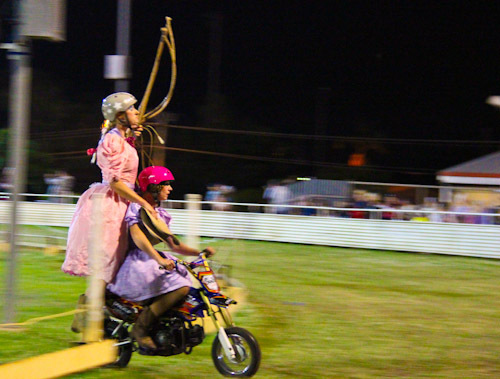 The act comprises of stunts on a miniature motorbike, cracking whips and general slapstick comedy. 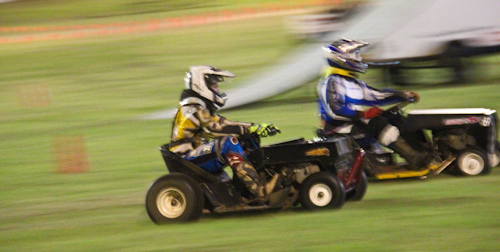 Ride-on mower racing is a new sport for us. These modified machines can reach speeds of up to 85kph, and it’s funny to watch them hooning around the track, occasionally spinning out of control. The souped-up lawn mowers run on 20hp motors but are still classified as lawn mowers because they have a "cutting deck". 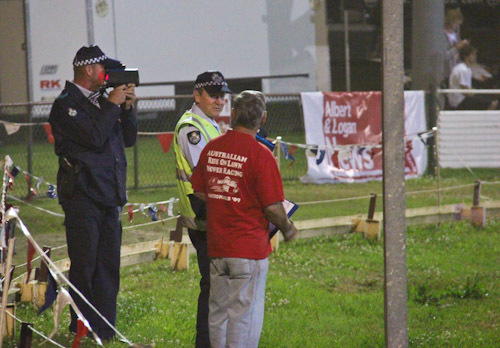 Police use a radar gun to measure the speeds of the racing lawn mowers. To watch the action in the main arena, we stood outside the fence with the other spectators. We decided to return to Sideshow Alley for some more rides. By this time, the girls were definite about the rides they wanted to go on, and even David had something in mind! 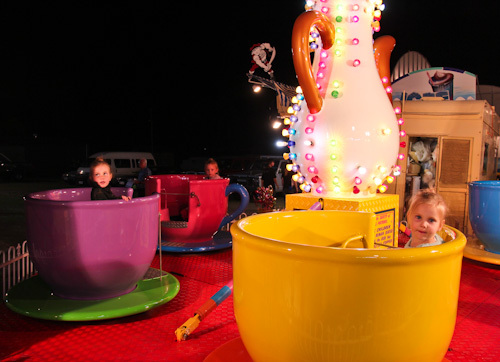 Our girls were excited to go on the tea-cup ride — it appealed to them the first time we saw it in the afternoon when we walked around the showgrounds. 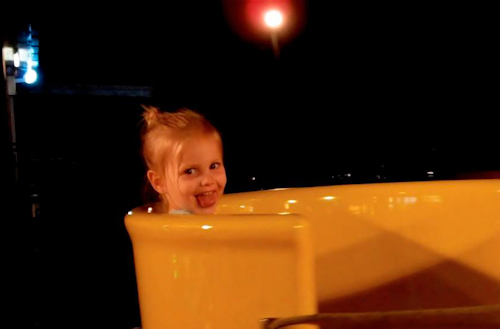 We love seeing this reaction on the faces of our daughters when they sit on the rides. 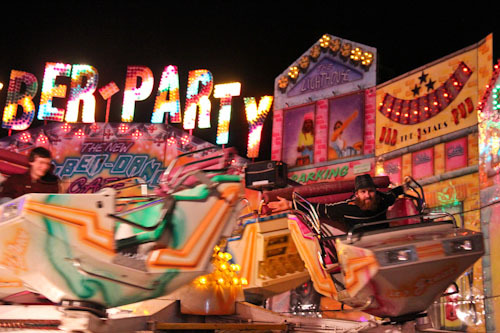 David's favourite ride was a high-speed thrill that he went on by himself. 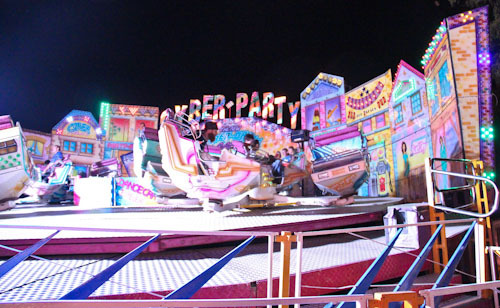 The ride sped up several times, and a strobe light came on to enhance the movement. 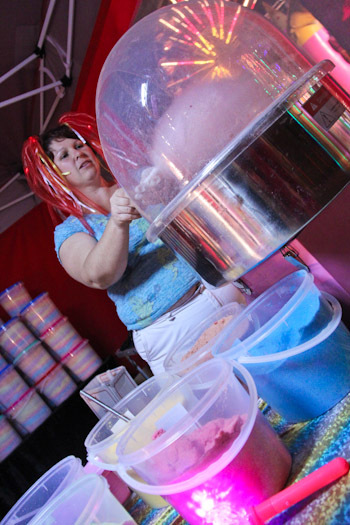 More for myself than for the girls, I paid for fairy floss on a stick and indulged in the pleasure of watching it made — a fascinating magic all in itself! 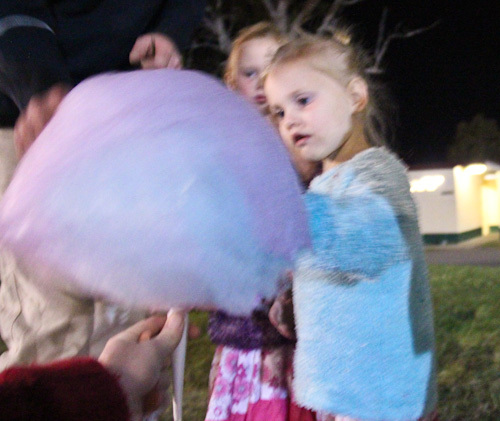 The girls love fairy floss, and our huge mound of cotton candy disappeared very quickly. 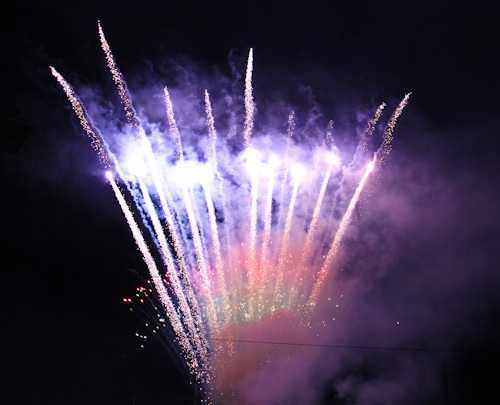 The grand finale at the main arena was the fireworks display. We love sharing memory-making moments like this with our children. 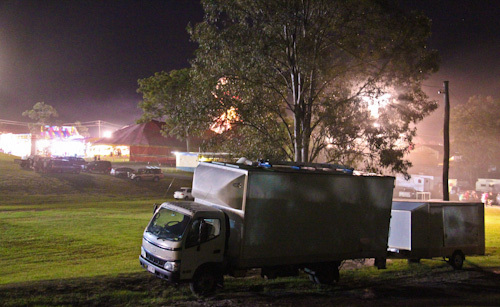 The last time we saw the Beenleigh Show fireworks, it was from the balcony of a local friend three years ago. This year, it was special to experience it up close with our girls. After the fireworks, Brioni and Aisha together approached us and specifically requested a carousel ride before bed. Their manner was so deliberately gentle and dignified — they looked like they were fully prepared to accept a “no” answer. Because they were asking in such righteousness, of course the answer was “yes”. The girls have been wanting to ride the horses on a merry-go-round ever since they heard about magical horses that rode off the circle and into the country in a recent bedtime story. After this last ride, we headed back to our truck which was parked close by. It’s wonderful not having to go far after a big day out like this — our beds are only a couple minutes’ walk away! Our overnight parking spot is at the back of the showgrounds. 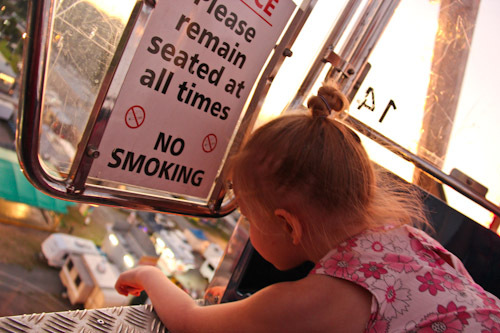 We really enjoyed the rides and the experience of the Beenleigh Show. It’s special to us because it’s our “hometown”, and we’ll take these memories with us as we continue our travels in Australia and further afield! Looks like you guys had a lot of fun! Oh, and the quilt of the red headed woman is GORGEOUS! Wow that looks like a fantastic time! 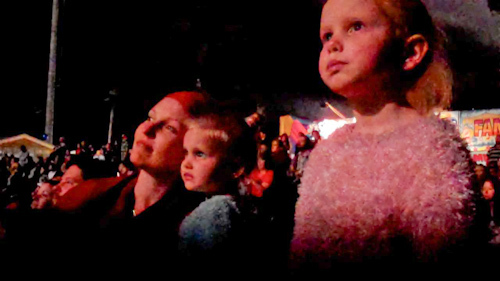 That was amazing – how brave your girls were to go that high up! Love how they enjoyed all there was to see, and all there was to ride. 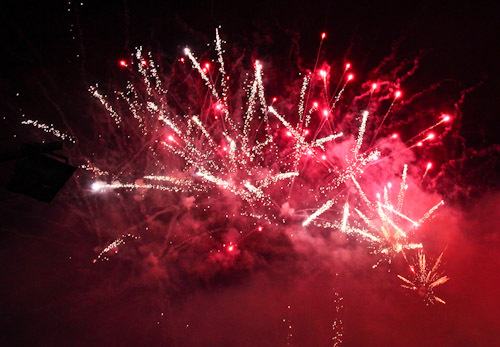 The fire works are always our favorite where ever we are!